Royal Links was built to honor the rich history and tradition of the game of golf. Designed by Dye International, this links-style course features holes inspired by eleven different British Open rotation courses, including the Road Hole and Hell Bunker from the Old Course at St. Andrews and the Postage Stamp from Royal Troon. Other courses in the loop include Carnoustie, Turnberry, Royal Liverpool, Prestwick, Royal Lytham, Muirfield and Royal Birkdale. Monuments were erected at various locations throughout the golf course indicating the spots where great moments in British Open history took place. A Champions Wall stands near the all-turf practice range honoring American champions of the British Open. Golfers may choose to engage the services of a professional forecaddie adding to the "Scottish" experience. These forecaddies are knowledgeable about the history of each hole, as well the location of the 108 pot bunkers, some of which are hidden. Walking caddies are also available and are required for those who choose to walk. 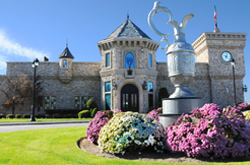 Royal Links features a castle clubhouse and authentic British Isles pub. 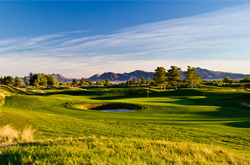 Royal Links was recognized as the "Best Course in Las Vegas" in the 2006 Review Journal "Best Of Vegas" poll and one of "America's BEST Courses" by Golf Week. 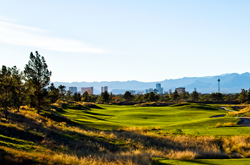 Royal Links is located approximately 26 miles East of the Las Vegas Strip.